What can i do in Algeria? Local, Expatriates, discover our Top 5 places to see in Algeria! What can i do in Algeria? What can i do during my periods of 6×3 or 8×2 rotations? That being the case, we would like to suggest our Top 5 places to go to during your rest periods, your holidays, or simply your free time in Algeria! Annaba is one of the oldest cities of Algeria, founded in 1295 BC. It is the fourth largest city in terms of population and area. It is located some 100 km from the Tunisian border. To the south, you will find St. Augustine Basilica, a true symbol of the city. Annaba is full of archaeological sites: you will enjoy strolling between the remains of the Roman Empire. 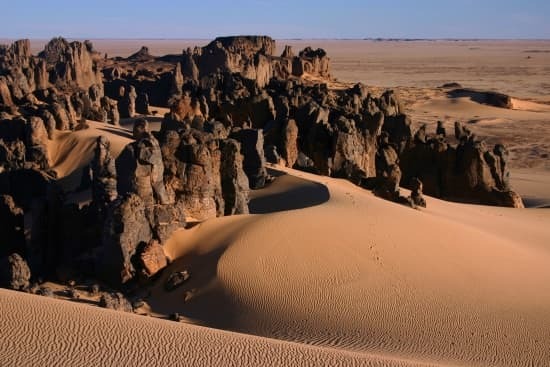 Located in the heart of the Sahara, in the Ahaggar National Park, the Hoggar Massif stands at 2918 meters. The most courageous can try climbing on its walls carved and colored with a thousand lights. From October to March, you will have pleasant temperatures because the sun is less exhausting than in the rest of the Sahara. While crisscrossing the corner, you will meet the Tuaregs, the blue men of the desert. They are very hospitable guides and excellent cooks. Constantine, one of the oldest cities in the world, is today the third most populous city in Algeria. Also known as the “city of suspension bridges” or the “city of the old rock“, it enjoys an exceptional location perched at 640 meters above sea level. It is literally cut in half by a deep ravine where flows the wadi Rhummel. This stream crosses the four suspension bridges that connect the city between it. It is considered to be the capital of eastern Algeria. Located in the north-west of the country, “Oran la Radieuse” (“Wahran El Bahia” in Arabic), is the second largest city of Algeria. His name “Wahran” (Oran in Arabic) comes from the word “Wahr an” (two lions). Legend says that in the year 900, there were still lions in the area. The last two hunted lions were on the mountain near Oran, which is called “The Lions Mountain“. In front of the town hall of Oran, two great statutes symbolizing the two lions in question are found there. You will also discover many fortresses such as the Fort Lamoune or the Fort of Santa Cruz, from the different empires that settled there. To soak up the local culture, do not miss to visit the various museums that the city offers. The Ahmed Zabana Museum is our favorite! Algiers nicknamed El Bahja “the joyful“, El Mahrussa “the well-guarded” or El Beida “white” is the capital of the country and the largest city in Algeria. We invite you to visit the magnificent Basilica Notre-Dame d’Afrique, the fantastic Ibn Badis Mosque, or the wonderful Sidi Abderrahmane Mausoleum. The cultural and architectural diversity of the places will charm you. These gardens, created in 1832, are still considered today as one of the most important botanical gardens in the world. They are composed of ancient trees, a pool of water, colonnades, and exotic plants that will make your day a delight! You would like to mobilize your teams in Algeria as well? We can help you! Our Global Mobility service meets the needs of companies having export projects and wishing to entrust the management of the international mobility of their employees. Drawing on the experience of IOTA Group and its network of international subsidiaries, we offer expatriation solutions in line with the operational and budgetary constraints of our clients. For more details feel free to contact us!